“In the U.S. where new technology is quickly adopted, esophageal cancer is not very common, so we have a limitation in conducting trials—accruing patients and collecting data,” says Michael Rutenberg, MD, PhD, assistant professor in the Department of Radiation Oncology at the University of Florida Proton Therapy Institute. This presents a troubling dichotomy: Advanced technology that could benefit most esophageal cancer patients is not available where incidence rates are highest. One 1992 landmark study by Herskovic et al, however, changed the role of using radiation therapy (RT) for treating esophageal cancer.4 “Prior to this study, it was believed that the only curative therapy for esophageal cancer was surgery,” says Michael G. Haddock, MD, professor of radiation oncology, Mayo Clinic College of Medicine, and a consultant and chair of the Clinical Practice Committee, Department of Radiation Oncology. At that time, RT was a 2-dimensional treatment—anterior-posterior/posterior-anterior (AP/PA) with lateral and oblique fields that gave adequate dose to the tumor but high doses to the heart and lungs. Today, radiation therapy is indicated for patients with locally advanced esophageal cancer that has penetrated the muscular lining or when regional lymph nodes are involved. It may also be indicated for palliative care in metastatic cancer cases. For many patients, treatment involves a trimodality approach of chemotherapy, radiation, and surgery. While local control improves with the addition of resection, survival is less certain, says Dr. Haddock. Additionally, some patients with early stage disease show excellent survival following radiation and chemotherapy without resection. The standard of care also involves accounting for motion. At MD Anderson Cancer Center, Stephen G. Chun, MD, assistant professor, Department of Radiation Oncology, Division of Radiation Oncology, uses a 4-dimensional (4D) respiratory-gated scan to account for motion in treatment planning. He also uses deep-inspiration breath holds when appropriate. Both Drs. Haddock and Rutenberg also agree that proton therapy shows promise in treating esophageal cancer and, in particular, sparing the heart and lung (Figure 1). “Protons will have a really important role in future treatments,” says Dr. Rutenberg, noting that the University of Florida Proton Therapy Institute has treated roughly 20 esophageal cancer patients with protons. While patient volumes are limited due to lack of third-party payor reimbursement for proton therapy, this could change as results from clinical trials emerge. For instance, a 3-site study by the Mayo Clinic, MD Anderson and the University of Maryland that retrospectively compared 3D conformal therapy, IMRT and proton therapy found decreased pulmonary, cardiac and wound complications in patients treated with advanced techniques.7 Additionally, a randomized study comparing IMRT to proton therapy is expected to open for enrollment through the NRG Oncology cooperative group later this year, notes Dr. Haddock. “Of all the disease sites where protons might benefit patients by sparing the heart and lungs, esophageal cancer is on the top of that list,” he says. Several additional hot-button issues surround RT for esophageal cancer, including treating cancers in the lower esophagus, known as the gastroesophageal junction. The European standard of care is perioperative chemotherapy—chemotherapy before and after surgery—while the U.S. standard is chemoradiation before surgery. Genetics may also factor in to esophageal cancer treatment, as a small percentage of patients with esophageal cancer have the HER-2 gene receptor, the same gene found in some aggressive forms of breast cancer, says Dr. Chun,“We can potentially use a genetic test for the HER-2 receptor, especially in patients with metastatic disease, and if positive, they could be targeted with Herceptin or other treatment drugs,” he adds. While outcomes are not great for locally advanced esophageal cancers, some studies are examining immunotherapy and checkpoint inhibitors in combination with radiation therapy with promising response rates, says Dr. Chun. “I’m hopeful that immunotherapy can be incorporated if it is shown to improve patient outcomes to move the ball forward for this increasingly common cancer,” he says. American Cancer Society. https://www.cancer.org/cancer/esophagus-cancer/about/key-statistics.html. Accessed August 22, 2018. Hur C, Miller M, Kong CY, et al. Trends in esophageal adenocarcinoma incidence and mortality. Cancer. 2013;119(6):1149-1158. World Cancer Research Fund International. https://www.wcrf.org/int/cancer-facts-figures/data-specific-cancers/oesophageal-cancer-statistics. Accessed August 22, 2018. Herskovic A, Martz K, Al-Sarraf M, et al. Combined chemotherapy and radiotherapy compared with radiotherapy alone in patients with cancer of the esophagus. N Engl J Med. 1992;326:1593-1598. Shi A, Liao Z, Allen PK, et al. Long-term survival and toxicity outcomes of intensity modulated radiation therapy for the treatment of esophageal cancer: a large single-institutional cohort study. Adv Radiat Oncol. 2017;2(3):316-332. Lin SH, Komaki R, Liao Z, et al. 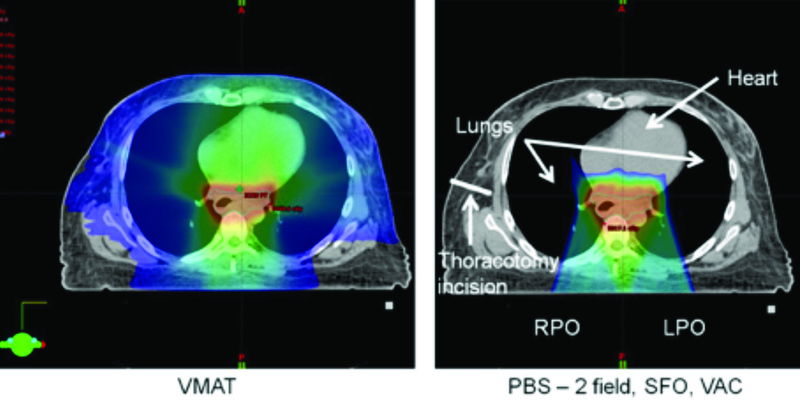 Proton beam therapy and concurrent chemotherapy for esophageal cancer. Int J Radiat Oncol Biol Phys. 2012; 83(3):e345-e351. Lin SH, Merrell KW, Shen J, et al. Multi-institutional analysis of radiation modality use and postoperative outcomes of neoadjuvant chemoradiation for esophageal cancer. Radiother Oncol. 2017;123(3):376-381. Cats A, Jansen EPM, van Grieken NCT, et al. Chemotherapy versus chemoradiotherapy after surgery and preoperative chemotherapy for resectable gastric cancer (CRITICS): an international, open-label, randomised phase 3 trial. Lancet Oncol. 2018;19(5):616-628. Pitroda SP, Khodarev NN, Huang L, et al. Integrated molecular subtyping defines a curable oligometastatic state in colorectal liver metastasis. Nature Com. 2018; 9:1793. Massat MB. Trends, trials and developments in radiation therapy for esophageal cancer. Appl Rad Oncol. 2018;7(3):49-51.